FroSty posted a topic in Let's Talk GFRIEND! Hey buddies! I'm going to be on holiday in Korea during Gfriend's Sunny Summer promotions, and it would be my absolute dream to get into a fansign while I'm there. Of course, this means buying loads of albums in order to get in by the lottery system, so I'll be selling these on afterwards (non-profit although I would have to charge for postage and packaging. I live in the UK so this may be a cheaper option for other euro buddies). If anyone would be interested in buying please let me know, and also what edition you would like so I have an idea of how many I can buy and which ones. 감사합니다! UmjiMyQueen posted a topic in Let's Talk GFRIEND! So I just bought the Time for the Moon Night time version album. I know you can get different photocards each time you order an album but does anyone know if the poster that you buy with it is different each time or not? I'm gonna buy the night and moon version as well but wasn't sure if I should hit the poster option again. Hi guys!!! I made some reaction vids for the Time for the Moon Night MV and the whole album, and wanted to share them here. So I thought it could be cool to start a reaction vid thread, if anyone here happens to have not heard the song yet or even if you have but wanna make a vid anyway cos it still hits me like a truck every time I listen to it, then post it here, cos it's always nice to see other buddies appreciating our girls. GFRIEND 5th Mini Album, "Parallel" Comeback! GFRIEND is coming back on the 1st of August, 18:00 PM KST with the 5th mini album, Parallel! First official announcement of the comeback was released on all GFRIEND Official SNS today, July 20, 2017, 10:00 AM KST. Reminder: This is an update thread. Please proceed to the Official LOVE WHISPER Spazz Thread to further talk about future expectations for the upcoming album! Return of GFRIEND, with "Parallel!" All Digital Music to be released at 6:00 PM KST! Mats Søvik posted a topic in Let's Talk GFRIEND! So as you know Gfriend is back after a long and "Rough" promotion period, with their first studio album titled L.O.L. So wanted to give a personal opinion on what i felt about the individual songs and the album as a whole. Im not gonna review the intro and instrumentals of course. This is my first written review of a album or music in my life hehe, but ill try to go as in depth as i can and as my knowlegde posesses, so bear with me cause this will be a long review. #LOL. I might do an review of the other albums later, maybe il even do a album review of an other artist/group in the "other topics" section of the forums for fun, we will see. 1. Fall in Love: (6.5/10) First i feel this song was probably not the best to start off the album with maybe it should be in the middle somewhere, as it may be abit slow to start off, but overall a decent song. Dont have alot to say about it as it wasnt alot of interesting things going on in the song itself it had the repeated line of "uri duri" but didnt find it very catchy like nav-nav-navillera. 2. Navillera (8/10) Now ive rated this one based on the choreo, music video and song itself so keep that in mind. First of all its a nice song with good vocals and has catchiness to it. Some standard Gfriend elements thrown into it soundwise with a retro synth to keep it fresh and true to the concept. It does sound abit like an upbeat version of Rough which i think was the intention of the composers Iggy and Seo, to maybe put the final touch of the era. Now the music video i found cute and they look pretty here, but it wasnt as asthetically pleasing as MGT and Rough for me, and maybe the biggest letdown was the lack of choreo/or brief scenes of dancing in the MV.. The dance break felt way to short and abit edited out or not focused on much which was a letdown. The choreography is still difficult but not as techinal or complex as previous ones. I did not find the point choreo (except the intro which was cool) as interesting as Rough which had the clock move, ballet spin, formations etc, and didnt felt as expressive as before though it tried. But atleast the dance fits the song and the x2 version was fire ;). 3. LOL (7.5/10) Except for the cool but short retro beat it felt abit like fall in love not very interesting, but liked it tiny bit better. Glad they are using the guitar riffs more in their b-songs, the lyrics was pretty nice too. 4. Distance (8.5/10) Definately an odd duck for Gfriend as they try the reggae genre for the first time. They did a good job with it overall and the song is one of the strongest entries on this album in my eyes. It has a pretty catchy beat with sweet singing and a harmonica which was a strong touch to a chill song, best to listen to for relaxation on a hot summer day, or maybe spring? 5. Water Flower (8.5/10) For me this song screams old school anime to me haha. I enjoyed the tempo and beat with rock elements and the Anime ost feel. This track just wants you to jam along with it and overall alot of fun to listen too. 6. Mermaid (7/10) Though it has some similar lyrics with Rough it has a different vibe. Not really a ballad kind of guy, but i liked the emotional tone and lyrics. 7. Sunshine(5.5/10) This time a R&B ballad. Again not fond of the genre so dont have much to say, it does sound abit generic and didnt really hit me emotionally 8. Compass (7.5/10) Now onto the now abit "controversial" track as some angry fx fans has gathered around and disliked the song on youtube and called it a plagiarism of the song Airplane on Fx album Pink Tape. First of all ive listened to it and it maybe has some feel of it since its both in the house genre but the beat and songs are different so i disagree on that part. Agree to disagree i guess. Ok the review of the song: After two emotional slow jams, this song brings back a dance worthy house genre style with a catchy beat but its not much more to it, outside of the beat the song is pretty standard layed out. but it was a good "wake up" song again after mermaid and sunshine. 9. Click (7/10) This song was strange for me. At first i liked the nostalgic feel back to the old 90s american pop music and it started kinda hype, but the verses more spesifically their voices was pretty offputting to me. I dont know if the composer/recorder of this song put a pitcher or some sort of autotone but their voices wierded me out abit. The song has some spice girls feel too it. Might edit the review of this track later as i havnt formed an absolute opinion yet. 10. Gone With The Wind (9.5/10) For me probably the best and most title track worthy song on the album, enjoyed this one alot. Loved the diversity and mixed genre styles all in one, Umji vocals really shines through in this song too and delivers the best singing lines in my opinion. After watching it live i have to give a big + to the choreo as it was excellent. 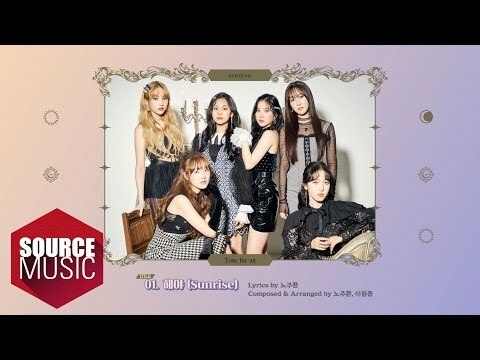 It start with a intro similar to SNSD Gee, into a more Gfriend style sound verse, into a anime-like and catchy chorus before it transitions into a dance break changing style to EDM with abit of dubstep sound which is a cool touch and adds flavor to the song, then it goes back to the catchy anime-like sound again until Yuju pleasantly belt outs high note after high note before the song ends off with some smooth guitar stuff and wraps up the album nicely like a gift. Definately a strong finish to a solid album. Overall Verdict 8/10 Final Thoughts: Overall this album has a more J-pop and anime feel to it than before while experimenting with new genres. Its good that the album has this certain feel since they are planning to make a debut in Japan later this year so giving this kinda vibe off will appeal well with the Japanese buddies and to new people unfamiliar with their past works and it will help smooth their transition over there, also with the addition with eng and Japanese subs on their main channel just proves Source Music yet again knows what theyre doing in terms of marketing the girls and appeal to a broader audience. Im glad they are experimenting with new genres and that leaves abit more to be desired in the future comebacks. As of the title track choice they played it pretty safe this time aswell giving a similar trademark style, if it were up to me i would put GWTW as the title for track just to show off the new genre experimenting theyve been trying out. I also think its a better song and choreo than navillera but Navillera is still a safe and good choice as people are familiar with it and it will do well on chart, music awards and with the Korean fans especially. So yeah this album is for sure a step in the right direction for Gfriend and its going to be exciting to see what they have to offer in the future aswell. So this review kinda run long so il cut it here for now i might edit some things later as i wrote this in one go and my opinions might change later, and please do shower me with feedback and criticism if you have, as i want to improve in future reviews. If its something you found unfair, off, wrong or grammatically wrong with this review please contact me and we can discuss, so thank you for reading and have a nice day!